Mantis developed the BioMant Herbi spraying system specially for the use of organic herbicides, e.g. using pelargonic acid. It can, however, also be used with other fluids such as organic plant fortifiers. In contrast to other herbicides, herbicides with organic ingredients have to be distributed in very large quantities (e.g. Finalsan® requires166 l/ha) in order to achieve the desired results (e.g. 166 l Finalsan® per ha). The optimal distribution of the required quantity of the active ingredient is achieved using flat-jet injector nozzles combined with the tried-and-tested flexible shielded sprayers from Mantis which automatically avoid obstacles, e.g. trash cans, traffic signs, traffic lights, etc. 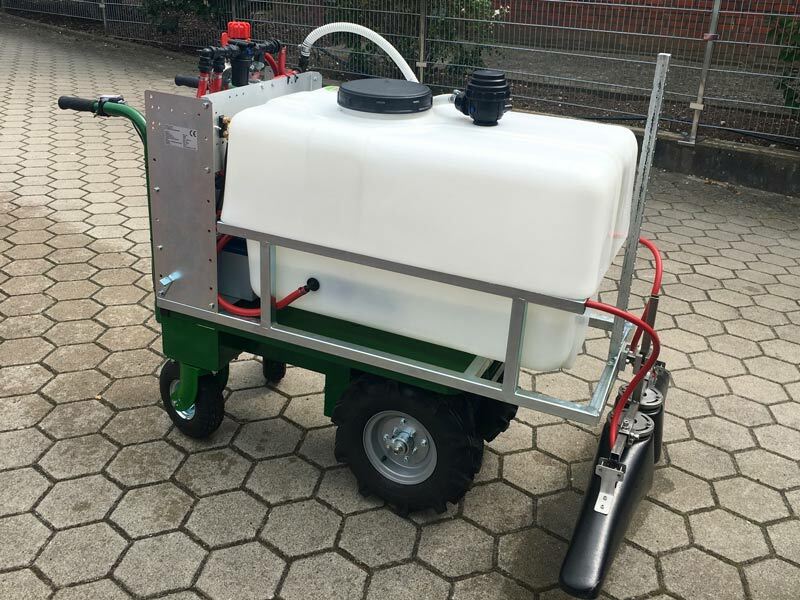 Due to the large quantity of organic herbicide required, the BioMant Herbi spraying system was primarily designed as an add-on spraying system for various vehicles so a sufficient tank can be carried with the unit. 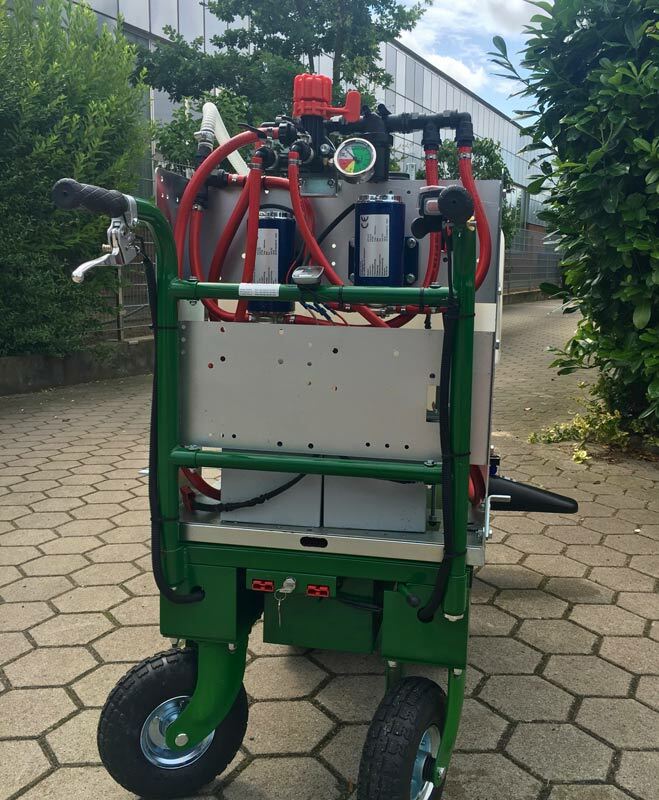 A BioMant Herbi model is offered as an add-on spraying system with an electrical cart (see photos). This cart has its own electrical drive and is operated “on foot” like a single-axle unit. The BioMant Herbi with electrical drive is very agile and has an operating duration of approx. 5 hours. The speed can be adjusted from 1-6 km/h using a speed controller. 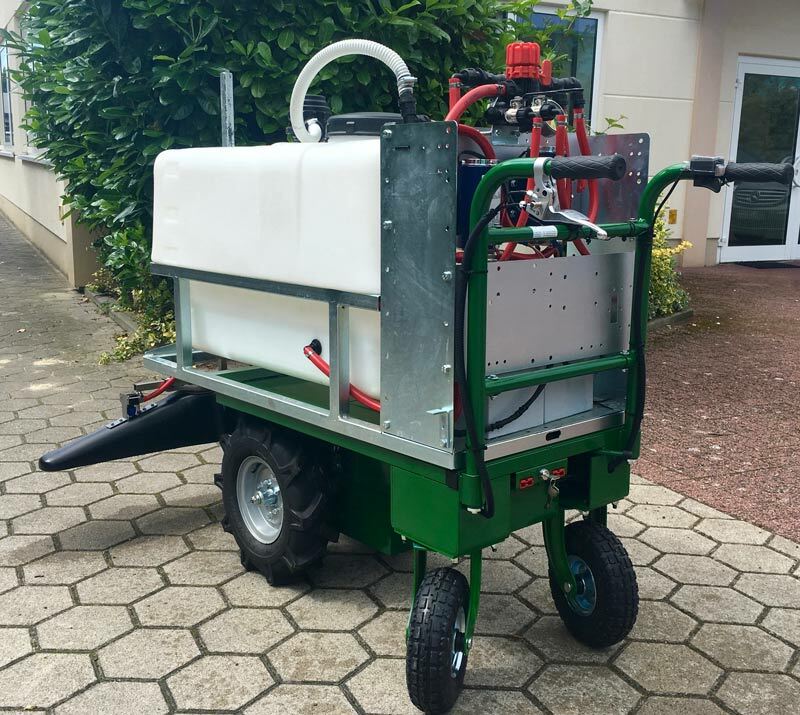 The BioMany Herbi "spraying unit”can also be installed on other vehicles (quads, tractors, etc. ).